And check out OUR NEWLY LISTED ITEMS. This is an original art page to Silver Surfer: Loftier Than Mortals #1, published by Marvel Comics. 22 from the issue, and is quite simply one of the best Doctor Doom pages you will ever find! It features a huge splash image close-up of Doom's face and then shows him flying around on the Silver Surfer's board, as he has stolen the Surfer's Power Cosmic. You can see that the board has been modified and has "spikes" on it, to give it an evil look that reflects Doom's persona. Doom is one of the all-time most popular villains in the Marvel Universe, and great pages featuring him are very difficult to find. Don't miss out on a rare chance to get a page that so prominently features the Fantastic Four's greatest villain. This is a great page that would look incredible framed and prominently displayed, and would be a key piece in any collection. Check out our other auctions for more great items. Check it out, you'll be glad you did! 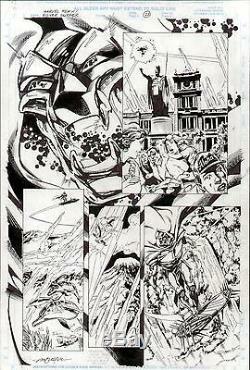 DOOM SILVER SURFER #1 ORIGINAL MARVEL COMIC ART PAGE SPLASHY DOCTOR DOOM" is in sale since Thursday, August 19, 2010. This item is in the category "Collectibles\Comics\Original Comic Art\Splash Pages". The seller is "satchj3" and is located in Brooklyn, New York. This item can be shipped worldwide.